SHORTLISTED FOR THE COSTA NOVEL AWARD. SHORTLISTED FOR THE BOOKS ARE MY BAG READER AWARDS. SHORTLISTED FOR THE SALTIRE SOCIETY FICTION BOOK OF THE YEAR. SHORTLISTED FOR THE BGE IRISH BOOK AWARDS NOVEL OF THE YEAR. 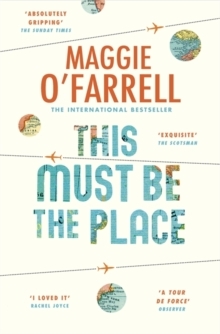 A top-ten bestseller, THIS MUST BE THE PLACE by Maggie O’Farrell crosses time zones and continents to reveal an extraordinary portrait of a marriage. ‘A complex, riveting novel of love and hope that grips at the heart’ The Sunday Times A reclusive ex-film star living in the wilds of Ireland, Claudette Wells is a woman whose first instinct, when a stranger approaches her home, is to reach for her shotgun. Why is she so fiercely protective of her family, and what made her walk out of her cinematic career when she had the whole world at her feet? Her husband Daniel, reeling from a discovery about a woman he last saw twenty years ago, is about to make an exit of his own. It is a journey that will send him off-course, far away from the life he and Claudette have made together. Will their love for one another be enough to bring Daniel back home?